Taking cues from classic menswear looks, Sheri accessorizes her tailored Isabel Marant tweed blazer and R13 boyfriend jeans with a vintage hat and NDC oxfords. Her necklace was a gift from Trina, handmade from vintage beads! Sheri makes a great model - love the picks!!! OMG! 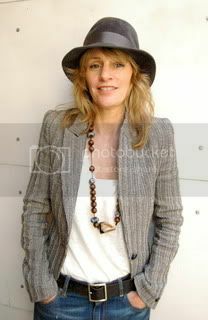 Sheri you look UH- MAZING in that fedora?!? !